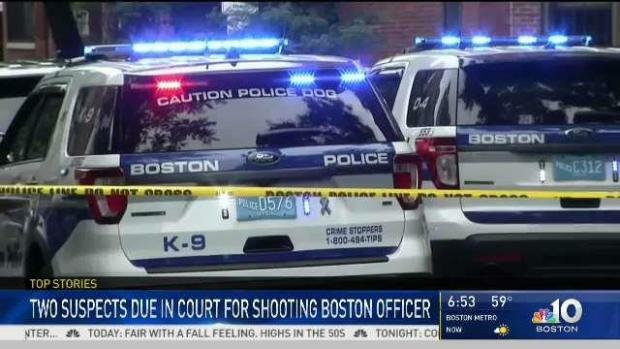 Two men charged in connection with the non-fatal shooting of a Boston police officer over the weekend were held without bail Monday pending a hearing to determine whether they are a danger to society. Two men were arrested Sunday in connection to a shooting that injured a Boston Police Department officer. The officer was shot in the calf after police attempted to approach a group of suspects believed to be armed. The two suspects were ordered to be held without bail pending a dangerousness hearing during their arraignment on Monday. Requon Martin, 21, of Boston, and Antoine Mack, 35, of Pawtucket, Rhode Island, both tried to keep their faces hidden at the arraignment. Not guilty pleas to charges from armed assault to murder were entered on their behalf. The officer was struck in the calf Sunday afternoon but has been released from the hospital and is resting at home, Police Commissioner William Gross said." We know he is physically well. We are going to make sure he takes the time so that he is mentally well," Gross said. Two men accused of opening fire on a Boston police officer over the weekend faced a judge on Monday. Mack's attorney, William Keefe, said his client was "not involved in this in any way, shape or form." Martin's attorney indicated that his client wants to testify in his own defense at the dangerousness hearing scheduled for Wednesday. Gross said members of the Youth Violence Strike Force came across a vehicle double-parked, with blaring music, when they noticed three men sitting on the steps of an apartment building. 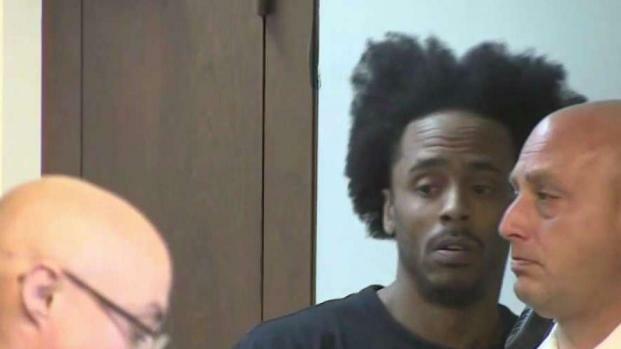 After making eye contact with the officers, Gross said the men stood up and clutched something at their waists, which he said were the "characteristics of an armed gunman." Martin lives at the address where they were spotted. The men then went into the apartment building and tried to hold the door closed to prevent the officers from entering, Gross said. After eventually gaining access to a common hallway, the shooting occurred. Only two men were charged. 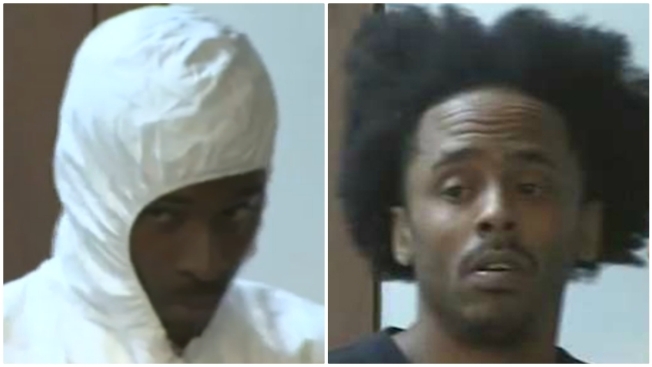 The two men accused of shooting a Boston police officer are facing a judge for their charges. Police have not said which suspect they believe fired the gun. Sunday's shooting was an example of how there are too many guns on Boston's streets, Gross said. "It's heart-wrenching," he said. "Folks are doing their job protecting the city. That's the attitude these days ... imagine one of your family members getting hurt. How would you feel about that?" Residents living in the neighborhood told NBC10 Boston they were shocked to see the scene unfold. "This is a very safe neighborhood, obviously, and just to kind of see this happening in our neighborhood, it's pretty crazy," one neighbor said. 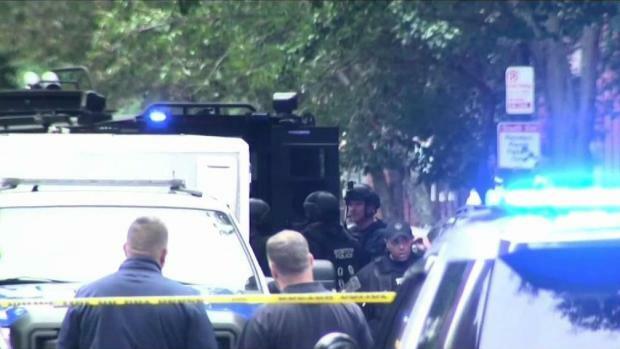 Two men were arrested and charged with armed assault to murder after a Boston police officer was shot Sunday afternoon in the city's South End.